Belleville’s downtown is awash in art galleries, most of which have been hidden behind construction fences for the past four years. 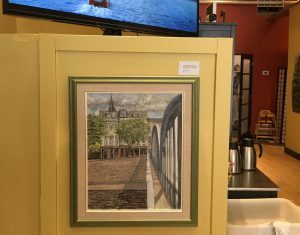 Some are official galleries like The Belleville Art Association, Gallery 121 or the Parrott Gallery, but many are hidden in restaurants and shops along Front Street and its side streets, waiting to be discovered. One of the best hidden galleries of the downtown is Thomas Estevez Design on the corner of Front Street and Pinnacle. Owned by jewellery designer Erin Thomas and her artist husband Jesus Estevez, the store is a feast for the eyes, with heaps of silver and gemstones on the counters and a gallery of oil paintings by Estevez lining the walls often depicting the beauty of downtown Belleville in every season. This section of Front Street is a hot bed of artist expression. Two doors down, artist Graham Gilmore has recently set up his studio. It is not open to the public yet, though he currently has an exhibition at the Oeno Gallery at Huff Estates. Across the road is the home of the Belleville Art Association, a cooperative of 110 local artists. The BAA is celebrating its 60th anniversary providing mentoring to new artists, workshops and painting parties, with new member exhibitions every six weeks. Their summer One By One exhibition is on display throughout August—stop in, they love visitors. Muralist and graffiti artist Christopher Bennett painted the mural on the back patio of Chilango’s Mexican restaurant and on the laneway next to The Belle Pub. 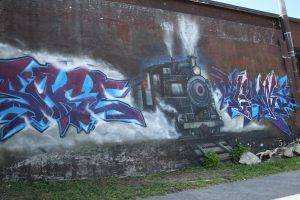 Bennett will be painting a new mural throughout August on the laneway between Ekort Realty and The Duke Pub. If you have an artistic bent yourself, Barrett’s Office Pros is a favourite haunt of local artists with its wide assortment of art supplies and knowledgeable staff. Shopping bag paintings by Florence Lennox. 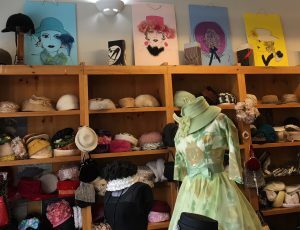 Boretski Gallery is a charming shop filled with vintage clothing and art. Above the hat display unit is a unique foursome of paintings by the late Florence Lennox of Belleville created for a local fashion show years ago. The paintings resemble upscale shopping bags complete with corded handles and profiles of glamorous ladies. They are not for sale but a memory of a much-loved artist. Ice Cream Art by Sharon Huckle. 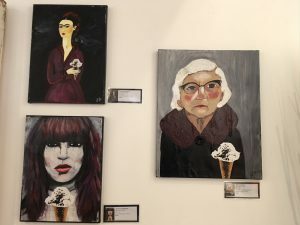 Take a side trip up Victoria Road to stop for gelato or ice cream at the Urban Bistro and have a look at the hilarious paintings in the café by co- owner Sharon Huckle. She has added ice cream cones to her renditions of famous portraits. There is nothing mysterious about Mona Lisa’s smile. Sharon also has samples of her pen and ink drawings on the walls of her hair salon, The Cat’s Meow, next door. promoter of local artists; he has about 50 paintings on the walls of his banquet hall supplied by the Belleville Art Association that are changed quarterly. Across the road, Sonia DeWal at Gourmet Diem Café displays works of art from several artists associated with Gallery 121. Coffee and painting by David Alexander. Strolling up Bridge Street East between Front and Pinnacle there are four venues for art lovers to enjoy. 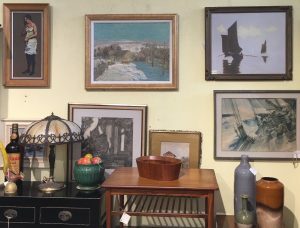 Dinkel’s Restaurant has a large selection of paintings from the BAA on display. Gallery 121, a cooperative of 16 very talented artists, is right next door and can be accessed from the street or Dinkel’s courtyard. It often hosts exhibitions of guest artists as well as its own members. The Indigenous Art exhibition every January is not to be missed. Antique Canadian paintings at Funk & Gruven. Quinte Arts Council has a gift shop in its office foyer filled with paintings, pottery, jewellery and stained glass from local artists—a lovely place to stop and shop. Jenn Hardenne, QAC general manager and Lenny Epstein, communications manager, are always interested in talking about new arts initiatives. Funk & Gruven is everyone’s favourite go-to shop for antiques, furnishings and inspiration. The walls are lined with paintings mostly from Canadian artists, including a Manly MacDonald original. To find more works by Belleville’s celebrated painter Manly MacDonald, 1889 – 1971 visit the Parrott Gallery on the third floor of the Belleville Public Library. 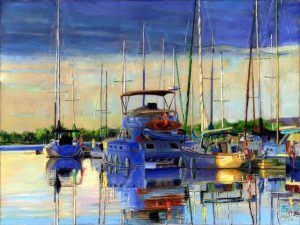 It has a permanent exhibit of his work as well as exhibits from local and visiting artists. 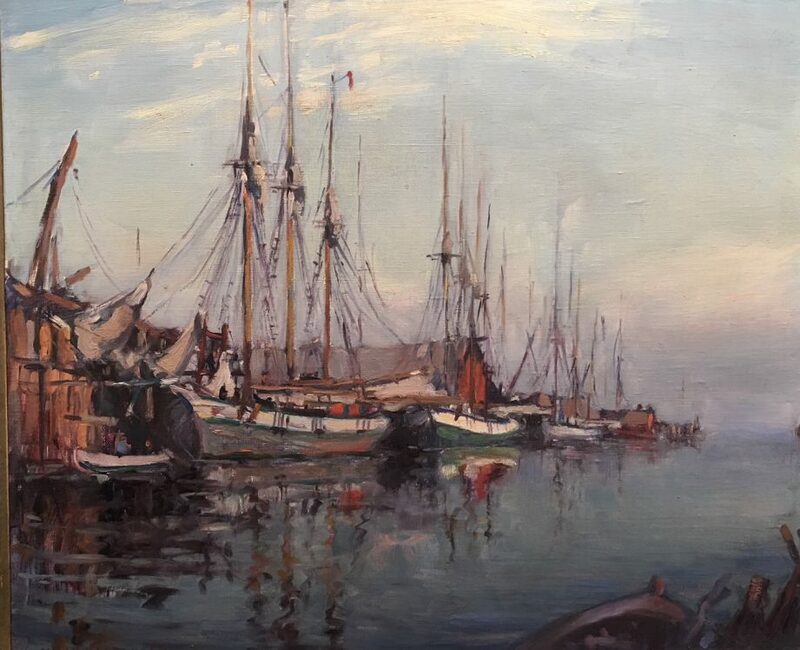 Ships in Belleville Harbour by Manly MacDonald. Four official Art Walks have been scheduled for this summer in the downtown, filled with music, dance, artist demos and culinary artistry. The next two are August 9 and September 13 from 4:00-7:00 p.m., but if you miss the hoopla, the art is still there waiting to be discovered. As you walk down Front Street, look up—with the many upgraded facades, the streetscape itself has become an architectural gallery. Veronica Leonard is a freelance writer living in Belleville who specializes in travel and wine tourism. Her blog can be found at The Wine Tourist. Be sure to check out our events calendar, follow us on Facebook, Instagram and Twitter and sign up for our newsletter for more of what happens here in the BoQ.